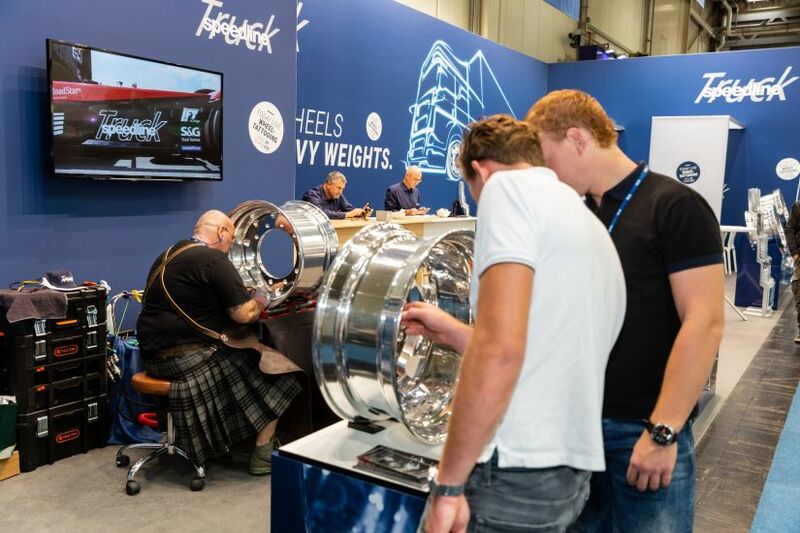 Alongside Trucker Princess Christina Scheib, we had another exciting visitor to our stand: on Saturday 22 September and Sunday 23 September, wheel tattoo artist Eddy from Berserker Metal Tattoo & Paradise Lost Tattoo engraved some of our SPEEDLINE TRUCK wheels in a live demonstration. You can see the result below! Edmund Schuster (53) from Austria was the first European to specialize in “tattooing” (i.e. engraving) truck wheels. Over the weekend, he gave a live demonstration of his tattoo skills at our IAA stand. He was also busy during the run-up to the event, tattooing two SLT 2907 wheels for us: one of them was presented to Trucker Princess Christina as a gift (we reported on this in our last story); the other one was on display at our stand throughout the trade fair, and was admired by lots of visitors. 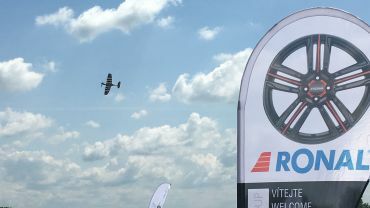 Incidentally, the wheel with the completed tattoo will shortly be the first of three great prizes to be raffled among all the visitors who took part in a voluntary survey at our stand! Naturally, we also had a few questions for Eddy. Eddy, how and when did you come up with the idea of becoming a tattoo artist? When I was 17, a friend asked me if I could tattoo the sword from the movie “Conan the Barbarian”, so I just drew one for the fun of it. I was asked, so I delivered – and that’s where it all started. I guess I was a natural. 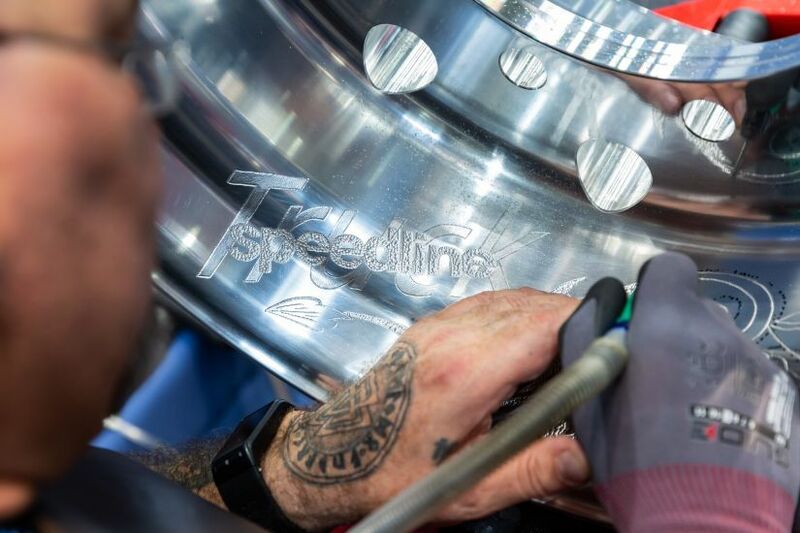 How and when did you get the idea of tattooing wheels, specifically truck wheels? Actually, the idea came to me when I was driving a good friend of mine to work. There was a truck dealership opposite, and there stood a beautiful truck with shiny aluminum rims. I was thinking that it needed something on it. So I just asked, and got this awesome wheel rim to have a crack at – and it all took off from there. I had no idea what kind of snowball effect that would have. I was invited by the tankpool24 racing team to the Truck Grand Prix at the Nürburgring and had the pleasure of presenting my work there. It was there that I also met Uwe Springer, Sales Manager at SPEEDLINE TRUCK for Germany and Austria. And now, at his invitation, I’m here at the IAA. An exciting and very cool experience for me! What are the differences compared to “normal” tattooing on the skin? Which do you enjoy more? The biggest difference is, of course, the “material”. Rims don’t whine or bleed. Both are fun; I find engraving wheels more calming. 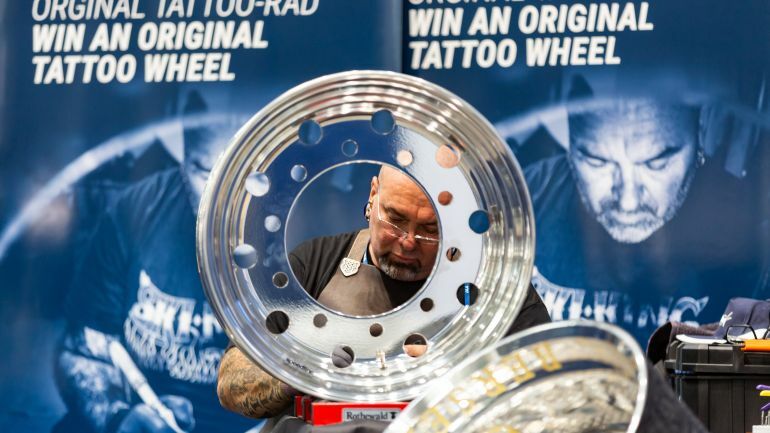 How long does it take you to tattoo a truck wheel? How much work is involved? What is feasible in terms of designs, etc? Who asks you for it? That depends on the design. 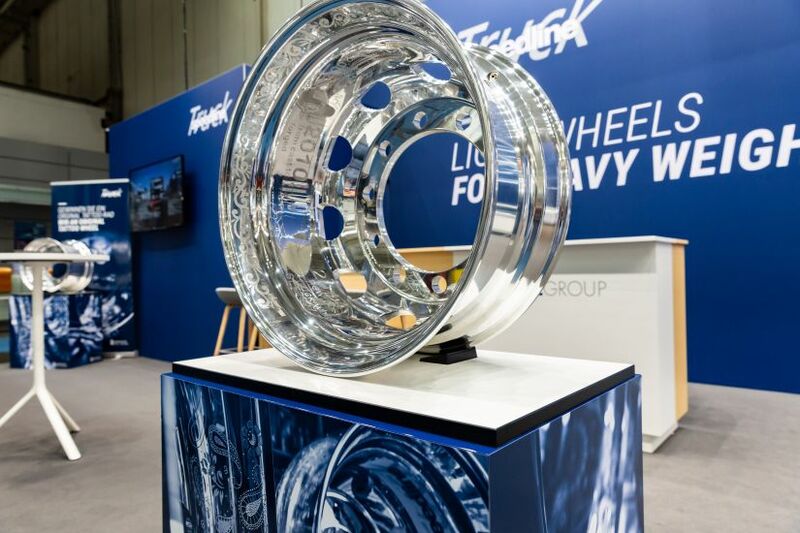 A fully tattooed truck wheel can take a week. Just about anything is feasible, from company logos or lettering to portraits. Of course, my years of experience as a tattoo artist really help. That’s probably also why I take a different approach to most engravers, and am establishing a completely new customer base. 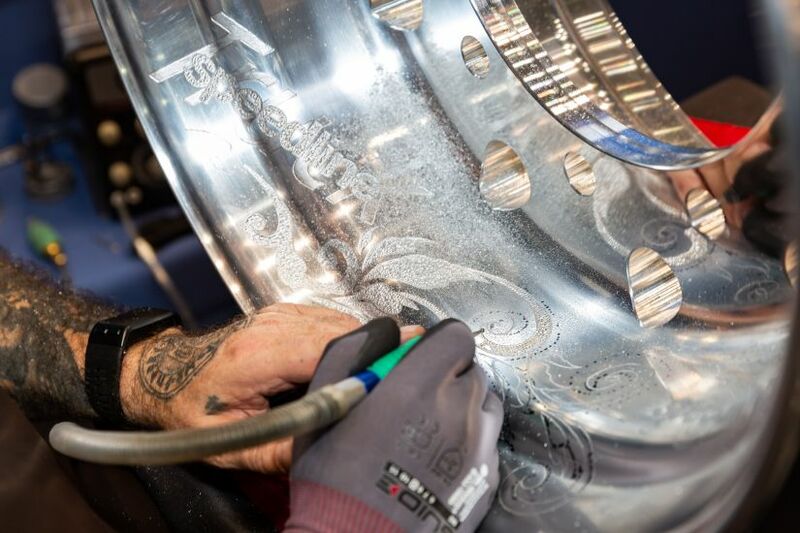 Orders come from haulage companies, rest stops, show trucks and truck racing teams who want me to embellish a trendy wheel rim. But of course, anybody can order something like this. The engraved rims might not exactly be suitable for the gravel pit, but I also create cool tables for the truckers’ lounge, for example. How essential do you think it is to have attractive wheels (on cars or trucks)? I mean, there’s airbrushing and leather, chrome and pinstriping. In the tuning industry, engraving is the next step! In the future, lots of components will be engraved. From turbochargers through to entire vehicles. I’m right there! 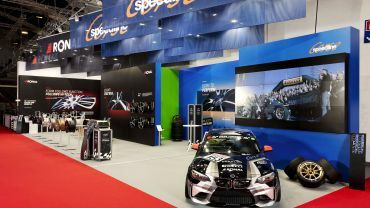 What did you think of the IAA, especially our stand? The trade fair was fantastic, huge and impressive. 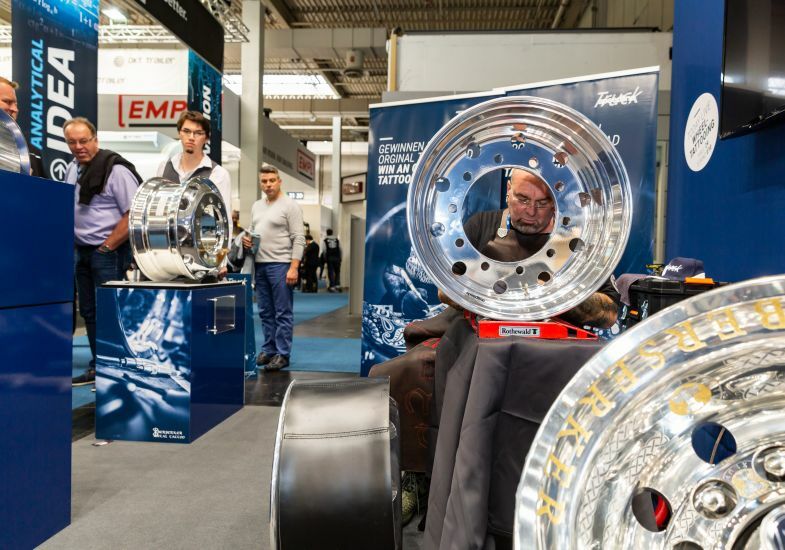 The SPEEDLINE TRUCK trade fair team was perfectly organized. I think we made a very good impression overall! The visitors to the stand were really impressed, hundreds of photos were taken and I enjoyed some great discussions. A very cool and successful weekend! How is an exhibition stand built? RONAL CR s. r. o. pulls in the crowds!